There’s an ever-expanding range of flavours out there, from simple stompboxes to rackmount beasts. These five all-analogue filter-centric effects units represent distinct points across the wide range of designs. A stone-cold classic is reborn as the compact Filterbank 2. Essentially, this flattens the original angled case and brings the impressive I/O array to the front, which works well with current Eurorack/modular setups. The Filterbank 2 is ear-meltingly awesome, capable of lush filtering as well as flying off into wild worlds of wobbly weirdness - usually at the flick of a switch. The two linkable multimode 12dB/oct filters are controlled by an array of features that dwarf the other four units: MIDI and CV I/O, multifunction ADSR and LFO, ripping distortion, source pitch tracking, and a pitch-interval filter cutoff control for extra-musical results. With no input, a noise generator kicks in to make it an instrument in its own right. This is a creative tool that extends beyond mere filtering and has utility across the board, from synth work and guitar effects to re-amping and sound design. For what you get, it’s reasonably priced too. The only stereo unit in the group, and featuring the only digital effect component (delay), the T-Resonator II is a knob-infested sound-design trip. The control surface is far from intuitive, despite the illustrative signal path lines, and it’s not best suited to ‘work-a-day’ filter tasks, but it does is at times magical. It comprises two low-pass filters (four-pole ladder) with LFO/envelope control and a delay engine, all connected by myriad feedback paths. The results can rapidly veer off into noisy soundscapes, but with familiarity can end up very expressive. Great-sounding, aimed at sonic adventurers. The Waldorf synth pedigree is audible with this simple, affordable mono two-pole filter (LPF, BPF, HPF). This is an easy-to-use unit that provides a great deal of control with the envelope and LFO sections (there are CV inputs too). Though the filter sounds great, the real magic comes with the Rectify and Drive controls, which dial in harmonic distortion to spice up the signal. This may be a line-level device, but there’s plenty of gain for high-Z instruments and pedal inputs too. This near-20-year-old Moogerfooger has become a benchmark, earning a space in studios and pedalboards worldwide. 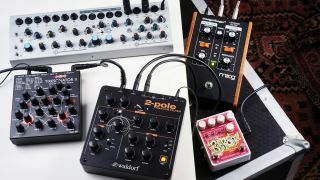 Classic all-analogue Moog tone pours out of the switchable two/four-pole low-pass filter, which can be shaped with the internal envelope follower as well as via four CV inputs. The Drive range can add the necessary harmonic distortion to make it a real character-former. Hard to beat, built to last and, unsurprisingly, holds its value. Despite the lurid paint job and silly name, the Blurst is a natty wee modulated filter pedal. 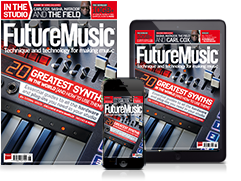 Though aimed at guitar and bass use, it’s a lot of fun on re-amped and synth sources. The divisible LFO (triangle, saw up/down) is controlled internally by knob or footswitch, or externally by CV/expression pedal, making it a useful rhythmic tool. The filter tone is not characterful like a Moog ladder or Mutron III, but sounds rich and really comes to life with the addition of distortion. Sherman Filterbank 2 Compact: Its reputation for quality and creativity is cemented, with only the Moog MF-101 as a rival. Waldorf 2-Pole: Offers the right balance of controls for satisfying hands-on filtering. It’d be hard to find a filter with this much flexibility for under £200.